This topic came up this week while I was presenting PhotoPills to a local camera club, and I thought it would be a great example to dedicate an article to with screenshots for future reference! There are going to be a lot of screenshots to make it easier to follow, so bear with me... The text below will reference the image above it. 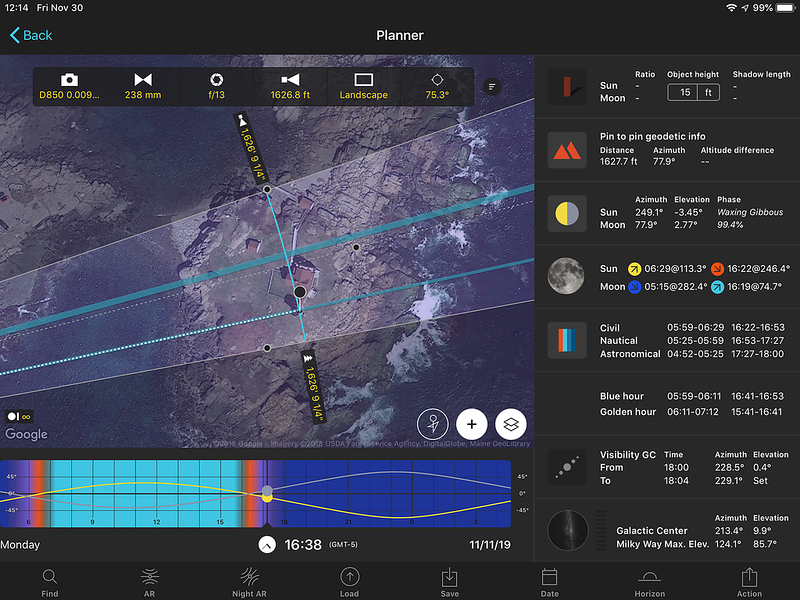 I’ve opened PhotoPills in the Planner module on my iPad instead of my iPhone, so the screen is much larger and the layout is a little different. 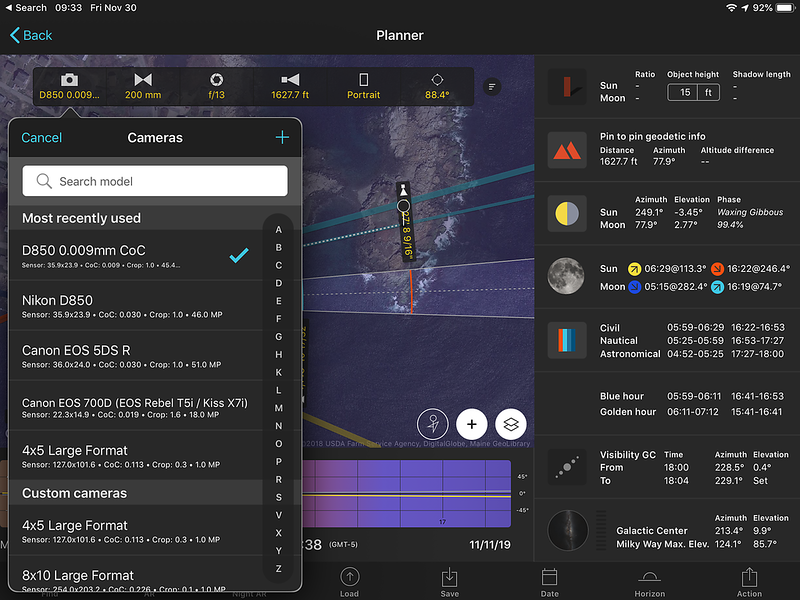 I prefer the larger screen of my iPad when I’m planning from home, and I use my iPhone in the field while I’m scouting and shooting. All of the data that was in a sidebar at the top of the iPhone is now on the right side of the screen, and can be seen all at once instead of having to swipe left and right through multiple pages of them on the iPhone. Android will be very similar, depending on the size of the phone or tablet you have. The orange pin is currently set to my GPS location with the current date/time when I took the screenshot. I’ve clicked Load and typed in Nubble to find Nubble Lighthouse on the map. 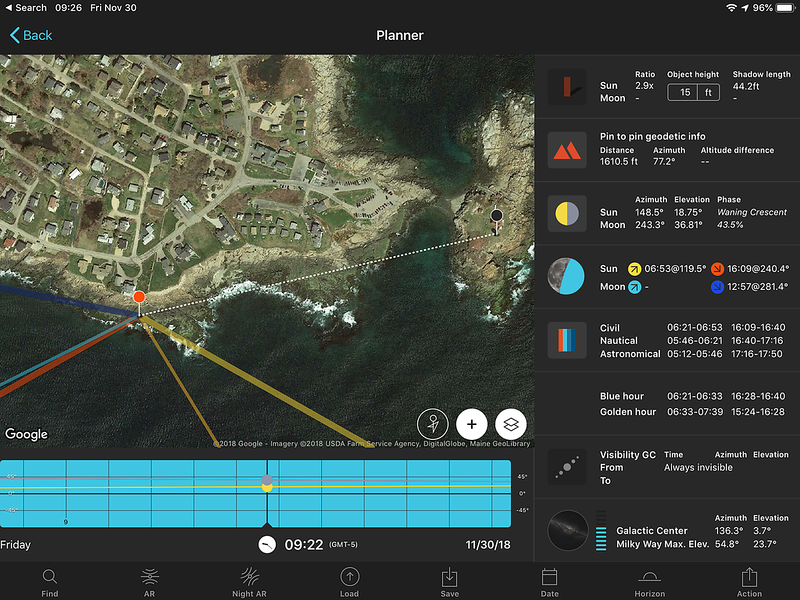 The orange pin is now set to Nubble Lighthouse in Cape Neddick, York, Maine. Looking up Cape Neddick Light or Nubble Lighthouse on Wikipedia tells us that the lighthouse stands 41ft tall, but the light itself is 88ft above sea level (due to the ledge it sits on). It doesn’t tell us the width of the lighthouse, which would be useful to know for our calculations. 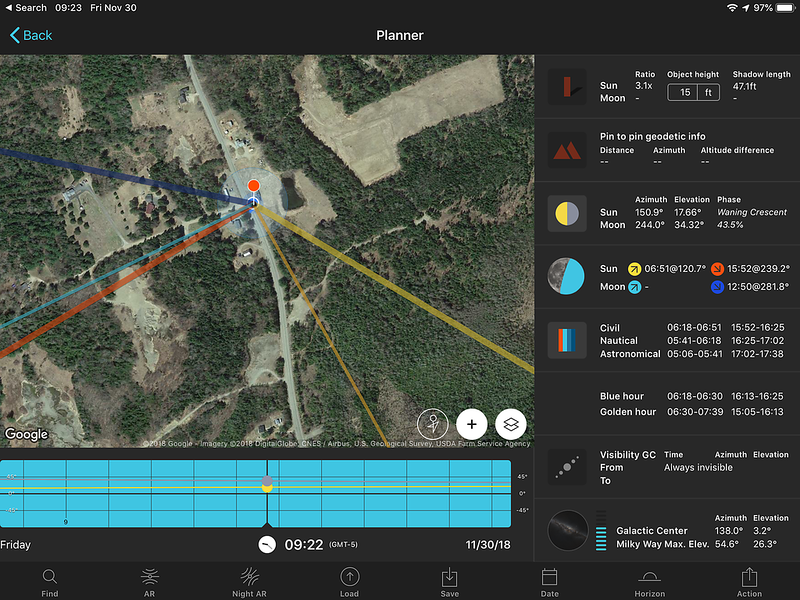 We can measure that on the map though by clicking on the icon for “Pin to pin geodetic info” which gives us a black pin on the map. By moving the black pin to the outer edge of the lighthouse, and the orange pin to the opposite side of the circumference, we can measure the diameter or width of the lighthouse. 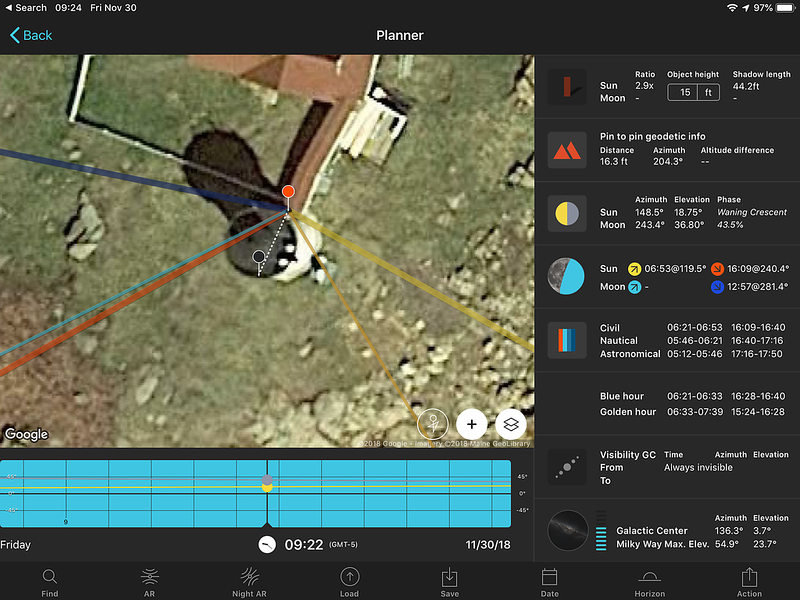 It is roughly 16ft according to the distance under the “Pin to pin geodetic info” tool. So we now know that we want the full moon behind a structure that is 16ft wide with the light itself 88ft above sea level. Now I’ve moved the orange pin out of the way for the moment, and set the black pin in the center of the lighthouse. It’s a little tricky because the aerial image on the map was shot from an angle, so the actual center is in the middle of the base, not the top of the lighthouse in this image. The black pin will be our subject, the orange pin will be our camera location. Now I have to choose a location on the map where I’d like to set the camera. There is a really cool rule of thumb for full moon shots called the Rule of 100. If you want the full moon to be the same size as any given subject, you have to be 100 times the distance away. 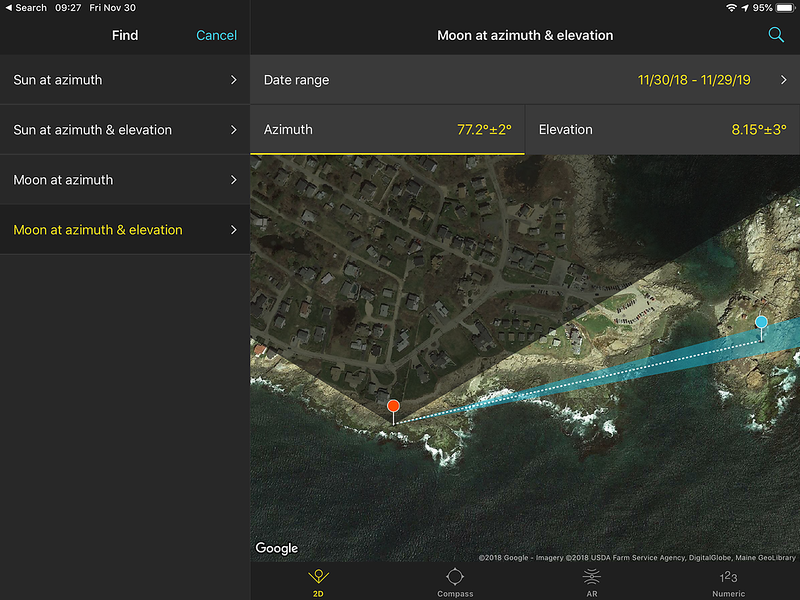 Since we measured the lighthouse width and we know it’s 16ft, this means the camera has to be 1,600ft away from the lighthouse for the moon to appear the same size. This means you’ll have to use a very long telephoto lens, ideally 400-600mm size at least if you want to fill most of the frame. If we tried shooting from the parking lot with a 200mm lens, we could easily capture the lighthouse, but the moon would appear much smaller next to the lighthouse instead of really large behind it. I’ve set the orange pin 1,610.5ft away along the rocky coast where I still have a clean line of sight to the lighthouse. Now we need to find out what date/time a full moon will appear from this location. 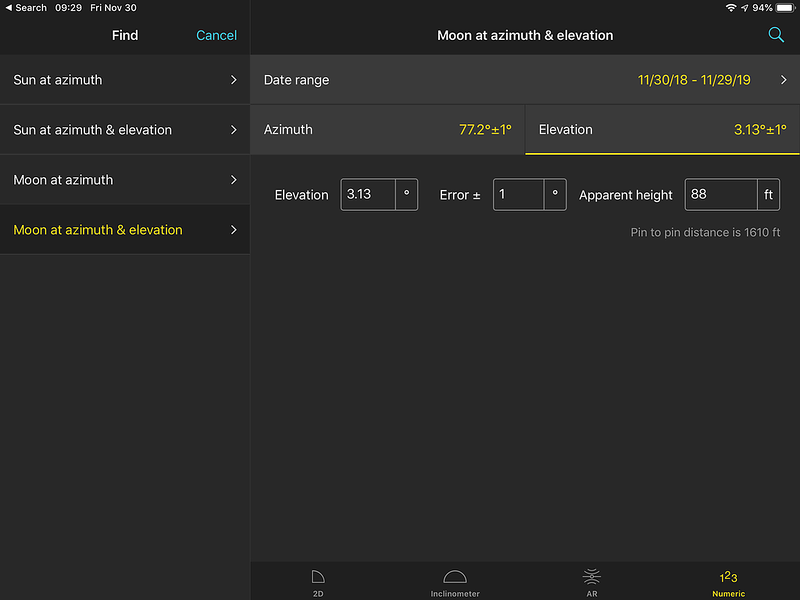 I’ve clicked the Find button in the lower left, and I’ve chosen “Moon at azimuth & elevation”. I didn’t capture a screenshot of it, but I clicked on the date range in the top right and set the start date to today and the end date to 1 year later. The Azimuth or compass heading is automatically set for you by the black pin at 77.2°. There is a +/-2° error or wiggle room, represented by the blue shaded cone. 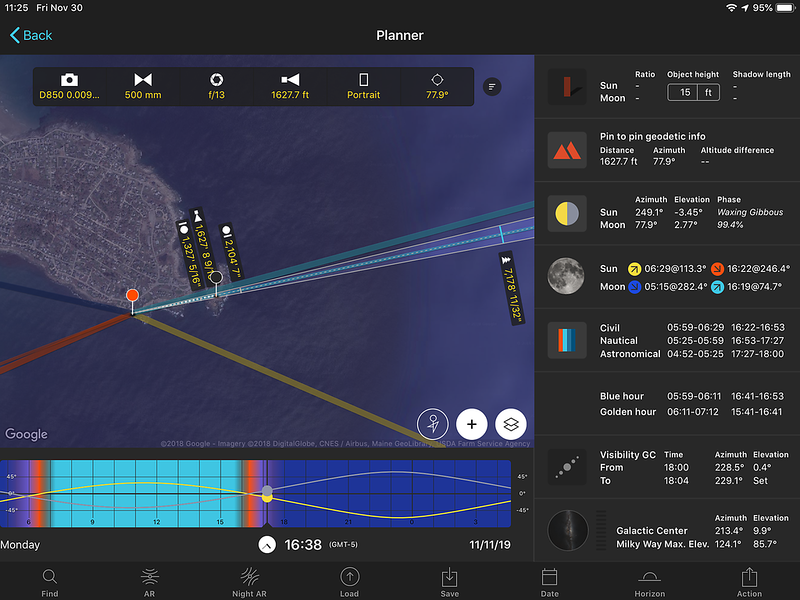 The dark shaded area at the top of the map tells me where the moon will never appear above the horizon, but since the lighthouse is in the bright area, I know the shot is possible sometime throughout the chosen date range for that compass heading and my camera location is probably good. Now we just need to set the elevation of the moon and tighten up the tolerance a bit. 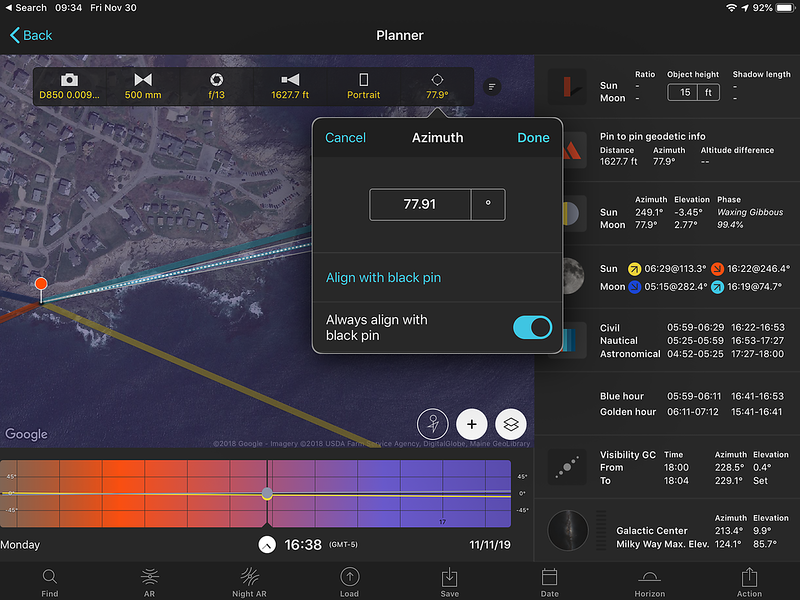 I’ve clicked on Azimuth, and then Numeric in the lower right, and changed the error to 1° instead of 2° to get a tighter alignment of the moon against the lighthouse. If you get no results at all, you’ll have to try a larger error of 2-5°, as long as you have room to change your camera position to line things up when you take the shot. I’ve clicked on Elevation, and by default it’s probably way too high for this shot. I’ve already set it to 88ft for this screenshot so the moon will be directly behind the lightbulb of the lighthouse. Click on Numeric in the lower right to do this. Here I’ve set the Apparent height of the moon to 88ft, and changed the Error to 1°, which sets the moon elevation to 3.13° above the horizon. 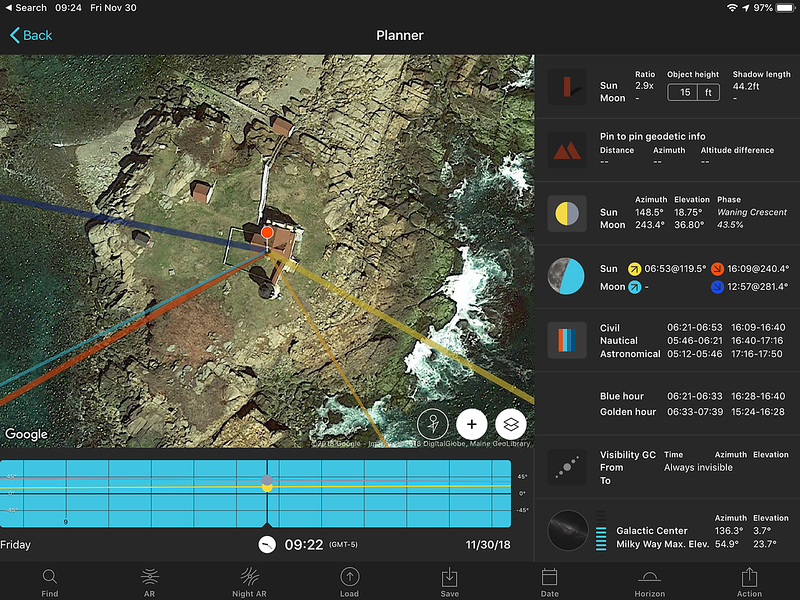 If you were onsite scouting this location, you could hit AR and see the full moon virtually through the camera at that precise compass heading and elevation, and make sure it lines up with the lighthouse for where you are standing! 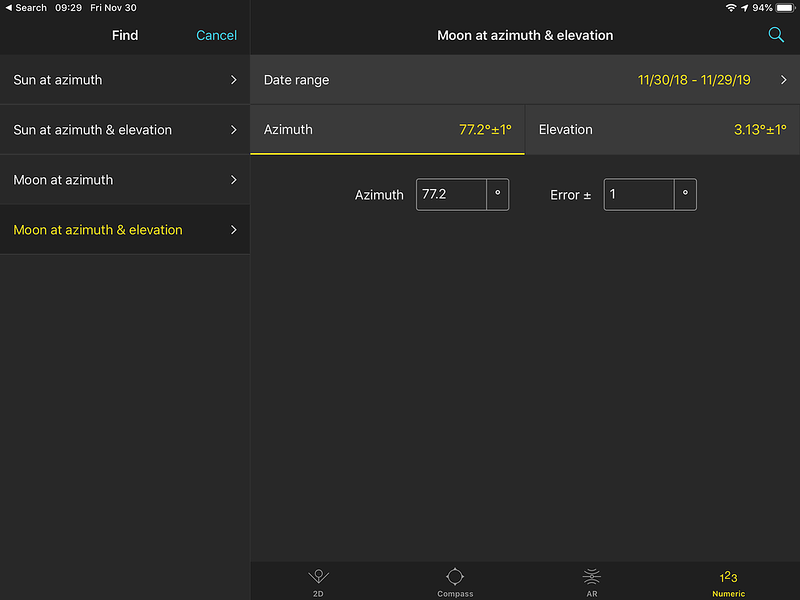 Now we need to find out what date/time the full moon will appear for this exact azimuth and elevation. 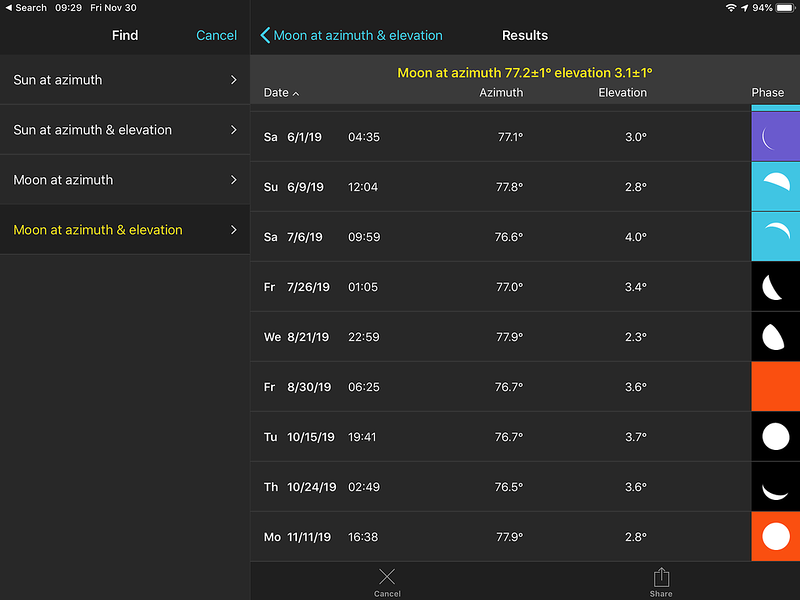 Click the find button or the magnifying glass at the top right of the screen, and you will get a list of all the times the moon will appear within our parameters. 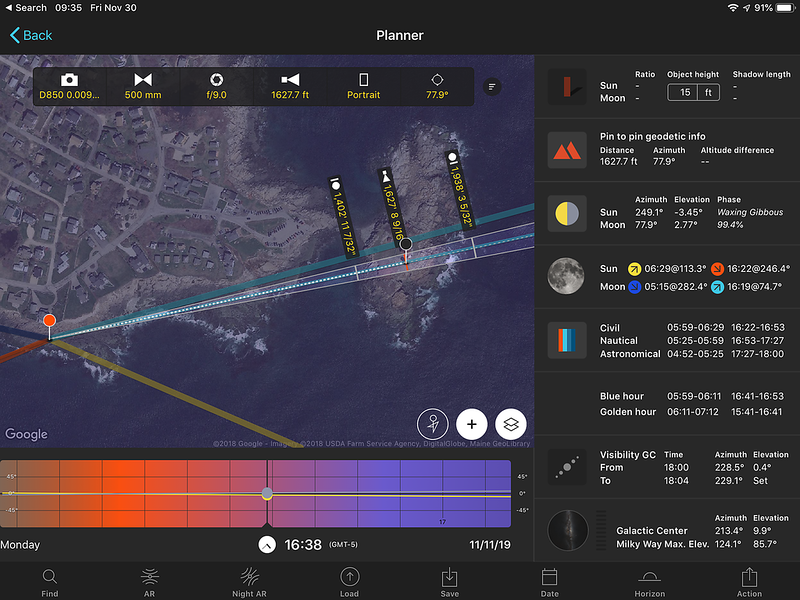 As we scroll through the list, we are looking for a full moon during golden hour or blue hour (orange and purple). If it’s black it’s at night and the lighthouse will be a silhouette, if it’s light blue it’s during the day and the moon will be washed out and pale. 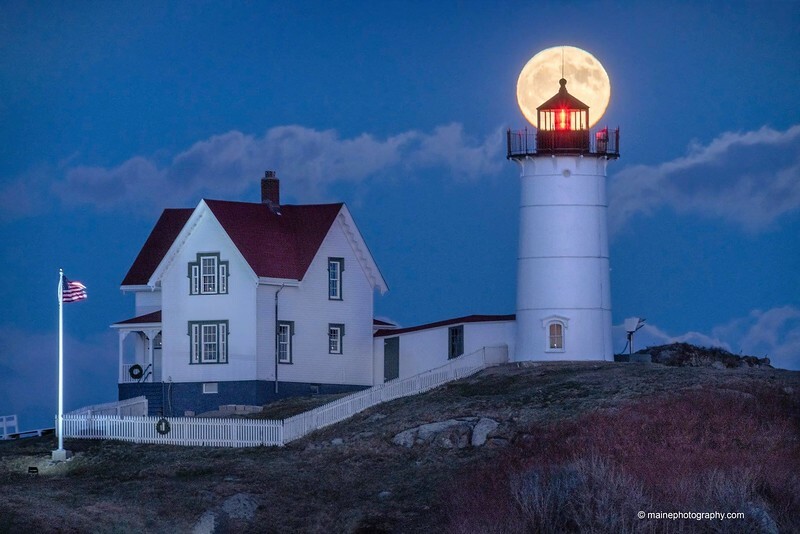 Golden hour and blue hour (when the sun is at an elevation between 0.5° above the horizon to -6° below the horizon) will work best to balance the exposure or brightness of the moon and the lighthouse in a single exposure without needing any exposure bracketing or HDR. Going to the bottom of the list, I’m going to choose 11/11/19 and plan my shot for next year. 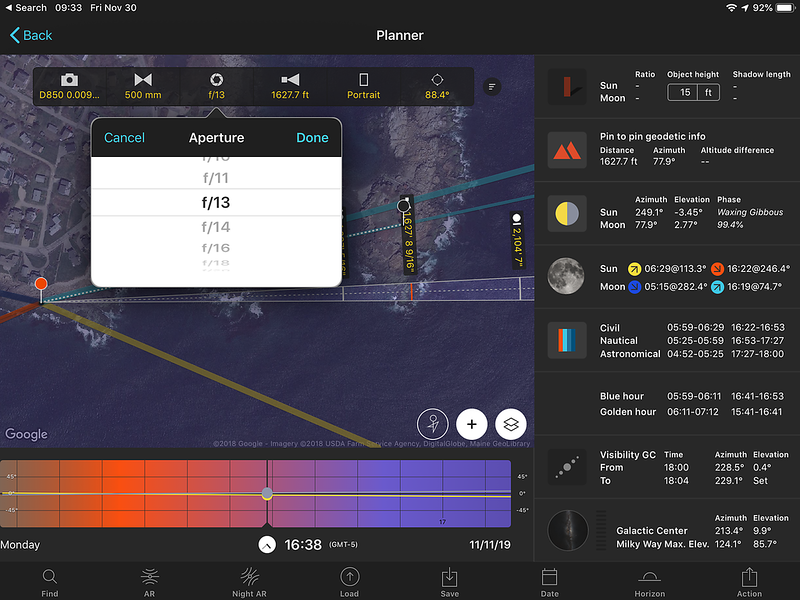 Click that date or the orange picture of the moon and PhotoPills will take you back to the Planner module with that exact date/time in the timeline. Here is 11/11/19 at 4:38PM. You can see the moon just barely misses our lighthouse by a few feet--the thin blue line just barely misses the black pin set to the middle of the lighthouse. This was within 1° of error or tolerance in our search, and is easily corrected by taking a step to the left or right. Simply move the orange pin slightly north to represent this. Here I’ve moved the orange pin slightly, so the moon now lines up precisely with our lighthouse at 77.9° azimuth (compass heading). The azimuth of both the moon and the geodetic pin match on the right. 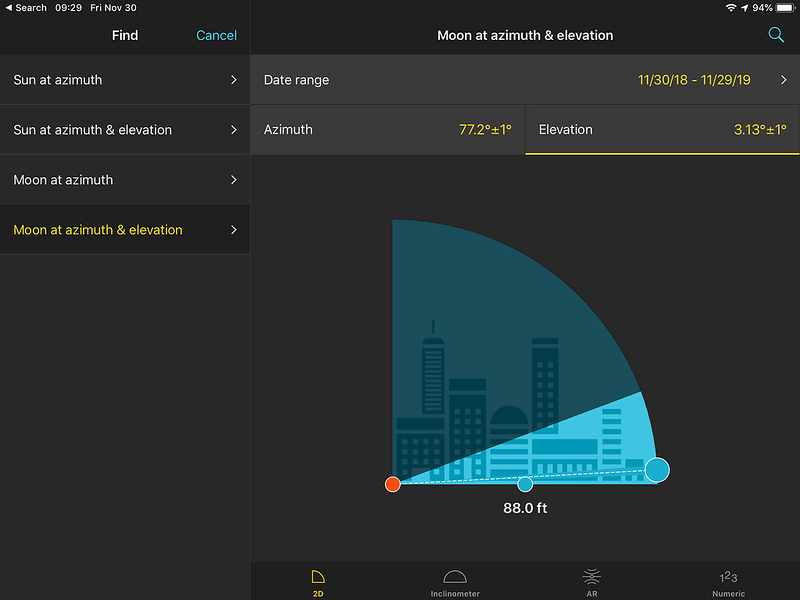 The moon is also at an elevation of 2.77° (about 77.9ft), so we might have to lower our tripod right to ground level, or accept that the moon is going to be slightly lower than the center of the lightbulb in the lighthouse. We also don’t know if the height of the ground terrain where the camera is set is precise (likely not). So there is a bit of trial and error to planning, and you’ll have to arrive onsite early and use AR to get a more precise tripod location. This just gets us in the ballpark. Let’s try out the new depth of field tool on the map! 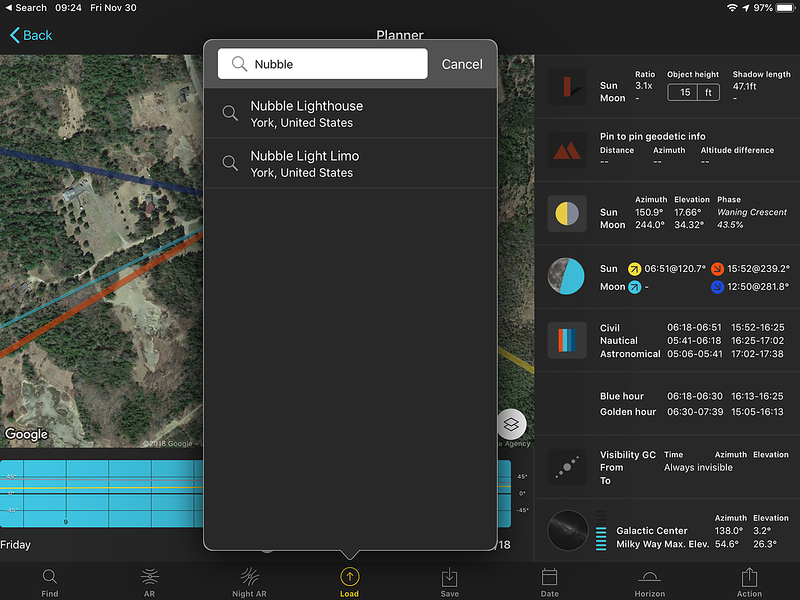 I’ve clicked on the map layers icon, clicked Map tool, and chosen Depth of field in the list. Click done and it will show up on the map. In the new information bar that shows up, choose your camera in the top right. I’m choosing my Nikon D850. I added it as a custom camera by clicking the + sign so I could use a custom CoC or Circle of Confusion of 0.009mm. Without getting too technical, PhotoPills uses a default value of 0.030mm for a full frame camera or 24mm x 36mm sensor which corresponds to an 8” x 10” print viewed from 10” away--what is considered human vision acuity. You’ll see this in the list for the stock Nikon D850 below my custom camera, it says “CoC: 0.030”. That’s fine until you want to print really big or zoom in to 100%. The D850 is 46 megapixels and capable of resolving far more detail than the default 0.030mm CoC--about three times more detail. To figure out what your camera sensor can actually resolve, we can take the sensor width, divide it by the number of pixels in width, and multiply it by two. In the case of my Nikon D850 that is 35.9mm / 8256px * 2 = 0.009mm. This means I could print a 24” x 36” and view it from 10” and have it just as sharp, but I’d need to use a CoC of 0.009mm instead of the default 0.030mm to get the focus calculations like hyperfocal distance and depth of field to be much stricter. You can ignore all this if you’d like, especially if you aren’t printing very large images. Just search for your camera model in the list and go with the default CoC. But if you want more accurate calculations, that’s how you go about it. Here I’ve chosen a focal length of 500mm (use whatever you have for your longest lens for this distance, ideally 400-600mm range). I’ve locked the focal length on the map so I can’t accidentally change it. Choose your aperture. I know f/13 is very sharp on my Nikon 200mm-500mm F/5.6 ED VR lens, and at f/16 or smaller my D850 will start suffering from diffraction due to such a high pixel density at 46MP. I can probably go as wide as f/8 for this shot too and still have enough depth of field, but we’ll find out in a moment. 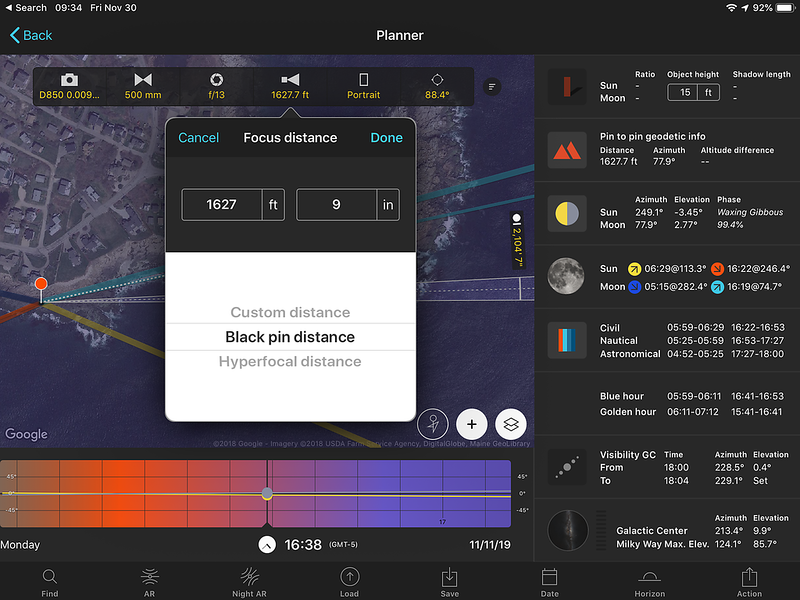 Click on the subject distance and choose the black pin, since we will likely be focusing on the lighthouse itself. At 500mm the hyperfocal distance is going to be a very long way away, especially with a custom 0.009mm CoC, so it’s not useful in this scenario as we will see. I already set the camera orientation to portrait instead of landscape for this shot, but it doesn’t really matter. Clicking on the Azimuth icon to the right, I clicked Align with black pin and set the toggle to always align with the black pin. Now when we look at the map, we can see that if I focus on the lighthouse 1,627ft away at 500mm, f/13, with a custom CoC of 0.009mm for a large print, that my total depth of field will be from 1,327ft to 2,104ft. This more than covers the entire island for my shot, and anything closer or further away will get progressively more out of focus. This obviously means the moon is going to be out of focus, especially for large prints. I’ll have to take a second shot focused on the moon itself, and blend the two shots together as a composite in Photoshop to get the sharpest parts of both, or I could use a wider focal length like 200mm and get a smaller moon and lighthouse as that will also give me a bigger depth of field. If we choose f/9 instead of f/13, we’ll see the depth of field gets narrower. But even going as far as f/22 won’t get the moon and the lighthouse both critically sharp, and I’d lose more from diffraction than I’d gain in depth of field anyway beyond f/16 with my Nikon D850, so focus stacking is really the only solution at 500mm from this “close” of a distance to the lighthouse. 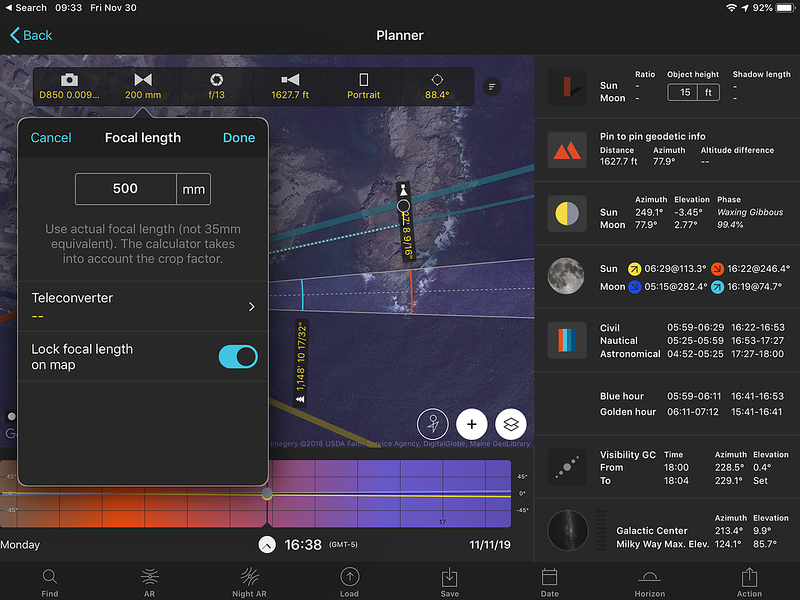 If we zoom out considerably, we’ll see the hyperfocal distance (the blue line) is a whopping 7,178ft away, where everything half that to infinity would be sharp with these settings (500mm, f/13, 0.009mm CoC). The lighthouse would be too close and out of focus if we used the hyperfocal distance. So let’s see if we can get the hyperfocal distance (the blue arc) closer to the subject distance of the lighthouse (the orange arc, too small to see here) by using a wider focal length like 200-300mm to get both lighthouse and the moon both sharp in a single photo, even if both are smaller in the frame as a result. Here I’ve changed a few parameters. 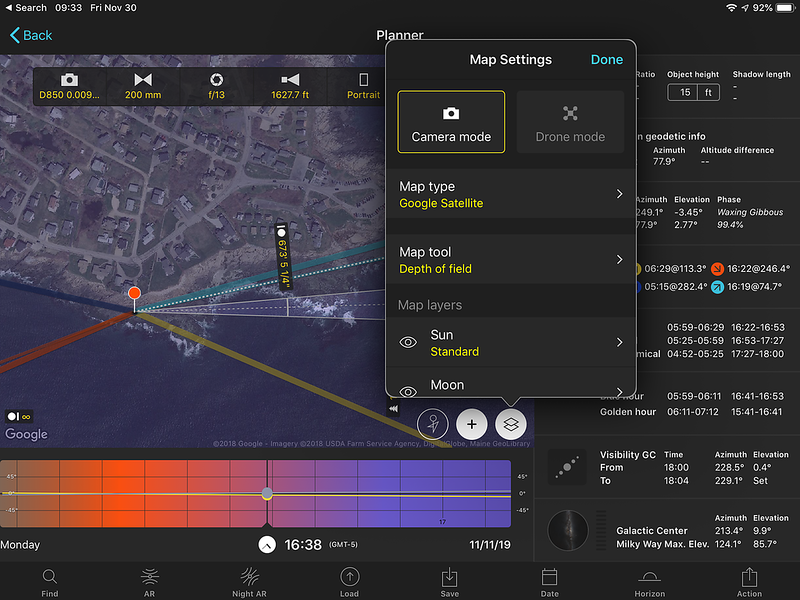 I clicked on the focal length and unlocked the “lock focal length on map” by toggling it off. I clicked on Focus distance and set it to Hyperfocal distance in the drop down instead of the black pin. I changed the camera orientation to landscape instead of portrait. And I unlocked “Always align with the black pin” by untoggling it under the Azimuth or compass heading button. Now I can zoom in on the lighthouse and I can change the field of view by dragging the little black dots apart to make a wider shot. I made it wide enough so the blue hyperfocal arc lands on the lighthouse (the black pin). The focal length happens to be 238mm. I’m still using f/13 for an aperture. This means that if I used 238mm or wider for a focal length at f/13 and I focused on the lighthouse 1,627ft away, everything half that to infinity will be sharp. In fact, it would be wise to set the blue arc slightly in front of the lighthouse to be absolutely sure the moon will be sharp, which will give you a wider focal length suggestion. You could use a longer focal length with a more lax CoC like the default 0.030mm for full frame cameras if you weren’t printing very large with a critical eye (closer than 10” in viewing distance). This would suggest a much longer focal length and would look good for even a large print on the wall if viewed from a couple feet away.